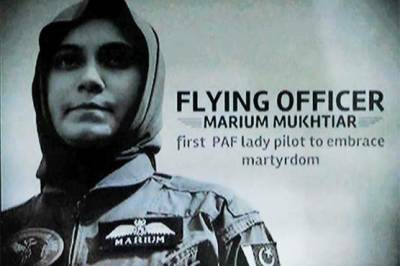 Islamabad (Web Desk): The nation is observing second death anniversary of Pakistan Air Force (PAF)'s first female Flying Officer Marium Mukhtiar today (Friday). Marium’s parents said while speaking on the occasion, they are proud of their daughter who sacrificed her life for the country. They also offered Fateha on her grave at Malir Cantonment Graveyard. On November 24, 2015, Mariam Mukhtiar and Squadron leader Saqib Abbasi were on their routine operational training mission when their plane FT-7PG crashed near Kundian, Panjab. Both occupants ejected from the cockpit and the plane crash-landed.Abbasi suffered minor injuries in the accident, however Mukhtiar died of her injuries in a military hospital. Mukhtiar’s death was declared a martyrdom or shahadat by the PAF, which said both pilots “handled the serious emergency with professionalism and courage and tried to save the ill-fated aircraft until the very last minute.